Qatar has launched a cruise, called ‘Grand Ferry’, that will connect the tiny Gulf country and its regional neighbors, Oman and Kuwait, which have not severed ties with Doha like Bahrain, KSA, and UAE. Grand Ferry will be first of its kind in the region to travel passengers on the sea. The 145 meter-long cruise ship will launch its first trip in January to Oman then to Kuwait. “We want to contribute to strengthening the relationship between the three countries by carrying more people. It has not been used in the Gulf before, and it’s the first for the region,” Faisal al-Sulaiti, owner of the ship told local media. He told the media that Grand Ferry may be extended to Iran if there is enough demand for it. 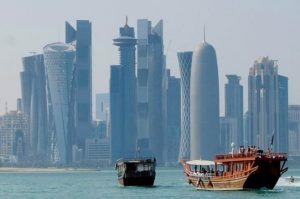 Qatar has found itself isolated by Saudi Arabia, United Arab Emirates (UAE), Bahrain and Egypt after the four accused Doha in June last year of supporting terrorism and defending regional arch enemy Iran. The boycotting countries also imposed a sea/air/ground blockade on Qatar. Doha has denied any wrongdoing and castigated the Saudi-led team of waging a smear campaign against it. The cruise can carry 870 passengers and 670 vehicles. The trip from Qatar to Oman will take 20 to 25 hours, and same time for the return to the Qatari capital. Posted by Jaber Ali on Dec 27 2018. Filed under Gulf News, Headlines. You can follow any responses to this entry through the RSS 2.0. Both comments and pings are currently closed.